Don't get me wrong. I liked the film adaptation of Dan Brown's "Angels and Demons" a lot, and the score was incredible. But, no this review has nothing to do with the film, the book, or the soundtrack. 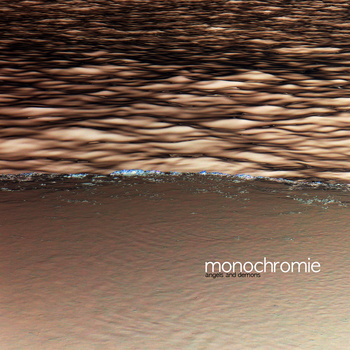 Today we are looking at the new album from French post-rock act Monochromie. Monochromie is the product of Wilson Trouvé. His music shows a unique perspective on the post-rock genre, presenting numerous attitudes and textures through the musical landscape. This variety is what makes Monochromie one of the best post-rock artists around in my opinion. Airy ambient structures collide with more earthen live instrumentals and keyboards, which are at times distorted beyond recognition. These opposing viewpoints, between light and bleak atmospheres, creates an impressive melody that at times flows like placid waters and at others like jumbles of boulders. Chaos is interspersed with calm. This texture may sound disjointed, but it works remarkably well. Citing influences ranging from Explosions in the Sky to Frederic Chopin to Franz Schubert, Monochromie is well-versed in several styles of music, including ambient, electronic, post-rock and even classical. This variety is presented well throughout the album. "Angels and Demons" relies on electronic ambient spheres of music played in tandem with heavily distorted live instruments to create melody, which is a tactic many post-rock bands employ. This album has no vocals. The music at times sounds uplifting and proud, and at others downtrodden and sad. These kinds of contrasts are present at every turn during this album. I can proudly give this album better marks than many of the other post-rock albums I have reviewed of late. This is on par with Hammock's new offering, and even better than Inner Trip and Ana Never. I highly recommend this music to fans of down tempo and electronic music, as well as the average fan not experienced in post-rock.